Polygames and EA stepped it up even further for the next release of PGA Tour Golf on the Genesis. The graphics have been further refined, and the player animations are now digitized video of the players’ actual golf swings! This gives the game a new look that really sets it apart from the previous titles. The drop-down menu system has been removed, but the traditional menu system that replaced it works just fine. The interface has been further tweaked, most noticeably by removing the bright colors used in the previous games. This helps the game to look less cartoonish and more realistic. The best change made to the game is the ability to adjust the arc and draw/fade of your shot. The ability to adjust the arc helps you to milk a few more yards out of long drives, but also helps keep your approach shot on the green. The game includes 8 courses, more than any other PGA Tour Golf title. New to the series are TPC at Summerlin, TPC at River Highlands, TPC at Las Colinas, and TPC at The Woodlands. The other four courses are carried over from PGA Tour Golf II. The same game modes from the previous title are all here as well. While it is still not possible to play as one of the PGA Tour pros, your player’s animation is a digitized rendering of an actual golfer as well. 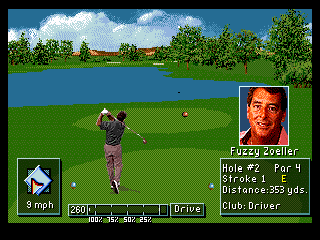 PGA Tour Golf III was the peak of the series on the Genesis, and is the gold standard for golf games from the 16-bit generation. Buy PGA Tour Golf III on GameGavel or Amazon. Tagged genesis, Golf, PGA Tour Golf III, Review, sega, Sports. Bookmark the permalink.